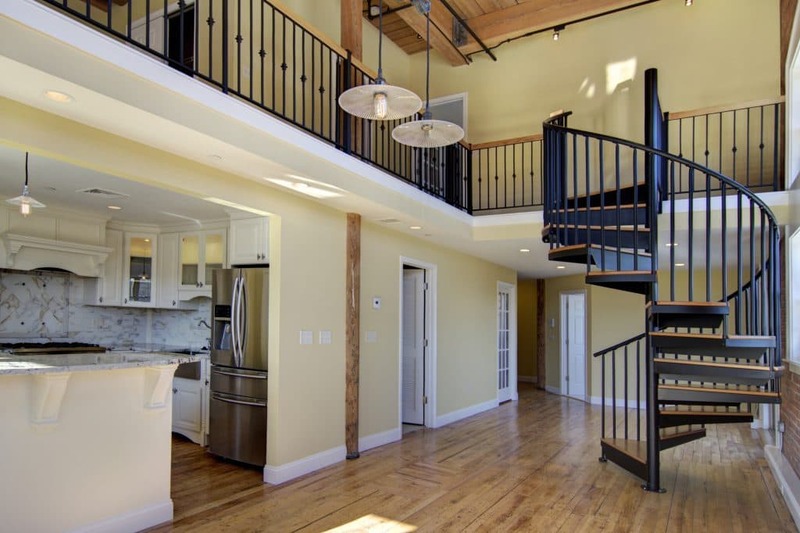 Lofts are a great way to create space in both the city and the suburbs! They have a magical quality of creating square footage out of nothing. This makes them great in small houses that need that extra room. They’re also a unique design aspect in larger homes that are looking to stand out. A loft doesn’t have to be defined by exposed brick and industrial furniture. The Complete Loft Conversion Guide lays out all of your installation considerations and design ideas for your residential loft! An added loft space holds many benefits, two of which go hand in hand. You are creating a new room and increasing the living space. A loft is a little different than a standard addition because not only are you creating a new room, but you are also opening up the space below the loft. You’re also adding square footage at a cheaper price than a full addition. This alone increases the value of your home. A loft also gives you a unique feature to your home that you will not find in other houses. By giving your home defining architectural features, your home’s valuation will increase. Most additions require planning permits and approvals from your local municipality. If you plan to make exterior changes, such as an outward addition or altering your roofline, you will need a permit. Most of the time, a loft conversion is completely interior. This makes your home renovation that much easier. Many times, the permit process is time consuming and expensive. If you’re not altering any plumbing or electrical, you will most likely not need a permit. The best way to be sure your loft conversion is completely covered is to call your local municipality. When comparing your loft renovation to typical home addition, your maintenance costs will be much lower. A loft is a room inside of a room meaning that it will have all of the same utilities that already exist. This means that any general maintenance on electric, heating, and plumbing that is done on the rest of the house will apply to the loft as well. This keeps the general construction cost low, as well as the recurring maintenance. This also means that there is less of a chance of utility malfunction in the loft. Compare this to a full room addition. You would have to wire the room separately, creating more opportunity for things to go wrong. As with any home renovation project, your loft conversion cost will be dependent on the scale of your project. Luckily, because a loft is included into the main house, you won’t have as much new construction as a full room addition. You will have no new walls to build and most likely will not have to rewire any electric panels. You will need lumber for the frame and the hardware to secure it. The average loft construction and conversion cost starts around $1,000. This will all depend on the size of your loft and any extra features you want to add to your design. When you’re looking to install a loft, a primary concern is how to access the space. Loft conversion stairs come in tons of different shapes and sizes. A loft ladder is the most basic stair option. With its simplistic design, it is the easiest to install and can be customized in a number of ways. It’s not the best choice for homes with pets or lofts that will be heavily used. The next option is the alternating tread stair. This stair is constructed by using platforms on either side of the stair to create individual treads for each foot. The motion is very similar to climbing a ladder. This particular design is very steep and may be difficult for any small children or elderly family members. Folding Stairs have the benefit of being able to be hidden behind a panel in the ceiling when they’re not in use. However, these stairs can be unstable and aren’t recommended for frequent use. A traditional stair is always an option when it comes to home design. This straight stair design does take up a large footprint so is best kept to homes that have excess space. 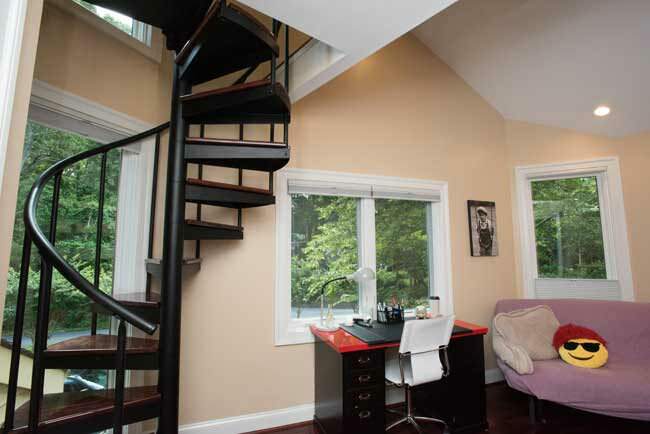 The last loft stair option is a spiral stair. This stair has a minimal footprint and can be customized to meet your home design needs. When you build a loft in your home, you need to find a way to enclose the space to ensure the safety of those using the space. If you chose to construct a loft rather than a room, you want to keep the space open to the floor below. You can keep this beautiful architectural element by using a railing to close off the edge. Railing also allows the pass through of light, meaning your home can still be filled with natural light during the day. This helps your home to feel bigger and more spacious. A popular railing option for homeowners is to use a railing design that matches your loft stair design. This integrates the stair into your home’s design and ties together your space. Some modern homes decide to use a glass half wall for an invisible railing. This maximizes the amount of light able to pass through. While it may seem like a daunting task, a DIY loft is possible. This particular project requires a little more DIY building experience than some projects, but you don’t have to be an architect to create your new space. With the help of a friend or neighbor, your loft can be completed in about two days. This makes it the perfect weekend project. You’ll begin by creating an anchor loft, or the frame that will hold the structure. After it’s in place, you can start to put the floor joists in place. This is particularly important as this will secure the structure and the safety of those using it. After the skeleton of your space is installed, you can install your flooring. Hardwood can be easily installed by bolting the wooden boards to the frame. However, carpet installation will include underpadding. The most important part of installing your own loft floor is to make sure the transition between the stair and your flooring. This is definitely something to consider if you’re installing your loft stair through a hole in the floor. A seamless meeting point of platform and flooring will ensure that anyone using the stair can easily access the loft without tripping constantly. Loft bedroom designs are the most common use for loft conversions. They gained popularity in urban spaces where square footage is at a premium and studio apartments are common. Homeowners are creating their own bedroom space by raising it above their living room or kitchen. This same idea was used to maximize the space in tiny homes, the recent microliving trend taking the world by storm. If you have ample room in your home but still want to use your loft as a bedroom, make it multifunctional. Create a living room that can be used as a guest room when you have company. Multifunctional furniture can transform your space in a matter of minutes. There are plenty of sofa beds options that are modern and can fit into any home décor. Home offices are becoming more and more popular as people are starting to work from home more often. With this professional migration comes the need for a new space in the home. By putting your home office in the loft, you are able to separate it from your living space. The physical separation of your living space and office space creates two different mindsets. You will increase your focus and productivity by keeping your work in its own space. However, you are still available to your family by keeping it an open space with railing. When decorating the space, consider deep cedar greens and maroons as they promote thoughtfulness. Gold accents support intuition making your home office the perfect place for work. If you have limited storage space in your home, your loft can be the solution! By using a storage loft, you can keep clutter out of the way of your living space. You may have room in your attic or garage, but by using a loft, you are keeping your other spaces open. A storage loft easily fits in the corner or the back of your home. With the right loft stair choice, it is much more easily accessed than an attic used for the same purpose. A storage loft is often times safer than an attic or basement. You reduce the risk of water damage or pests by having them attached to main livings pace of the home. Use your new loft conversion as a home library. 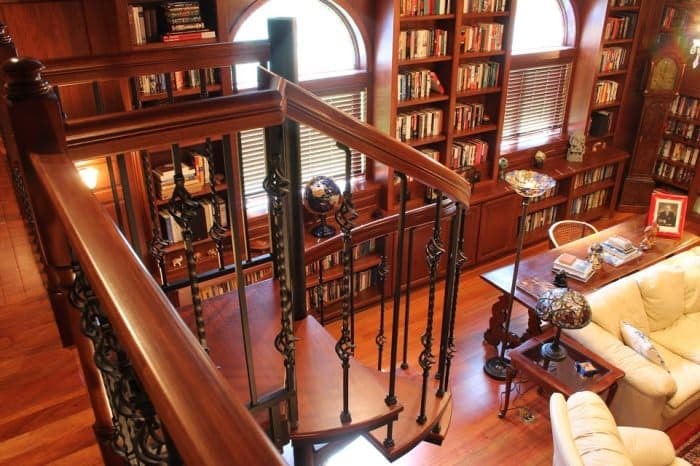 A home library is a unique addition to any home and is sure to add some grandeur to your home design. Not only can it be used as a quiet place to read, but as a relaxing space in general. Use built in bookshelves for your book collection and other small trinkets that you may collect. Use the décor to truly make the space. Comfortable seating is a must for any home library. Loveseats and arm chairs are the perfect choices when gathered around a coffee table. Use warm woods and jewel tones to create a rich color palette and inviting ambience for the room. Incorporate antique pieces, such as lamps and artwork, to tie the room together. Take advantage of the unique nature of a loft and create a fun playroom for your kids. Use home décor that you wouldn’t use in your normal living space; make it whimsical with themes, such as a castle or pirate ship. These themes combined with bright colors creates a space that any kid would love. Create an indoor treehouse for rainy days and harsh winters! By using lumber and paint you can bring the magic and fun of a treehouse indoors. One benefit to putting your children’s playroom in an open loft is that you can keep the face open with just railing rather than a full wall. This allows parents to hear and see anything happening in the space. If you have a DIY-er in your house, consider using the loft as a craft room. This is the perfect place to store your crafting supplies and in progress projects. By keeping your crafting limited to its own room, you make it more manageable than crafting on your kitchen table. You don’t have to worry about leaving projects out in space that you may need later. If you want to include your kids, add a children’s craft table. This keeps any extra art supplies away from your nice furniture and gives the kids a place to play on a rainy day. Lofts are a unique addition to any house. Not only do they create square footage without having to build a full addition, but they also create a dynamic interior for your home. There's a wide range of design styles and functions for your new loft space. No matter how you plan on using your loft, you'll need a loft stair to access the space. If you find that a spiral stair is the right fit for your home, give one of our consultative designers a call for pricing in five minutes or less! They can walk you through each step of the design process to create a spiral stair that meets your vision.